Long hikes? No problem with the Scarpa Kailash Trek GTX Hiking Boot. Constructed as an all purpose hiking boot, the Scarpa Kailash Trek GTX was built to do it all. Founded in 1938, in the Dolomite Mountains of Italy, Scarpa has a rich history of making quality handcrafted footwear. Today, Scarpa is well known as a leader in the hiking boot arena. This summer I have been spending my days on the trail in the Scarpa Kailash Trek GTX. Living in Steamboat Springs, Colorado allows for hiking daily and the constant search for the perfect hiking boot. 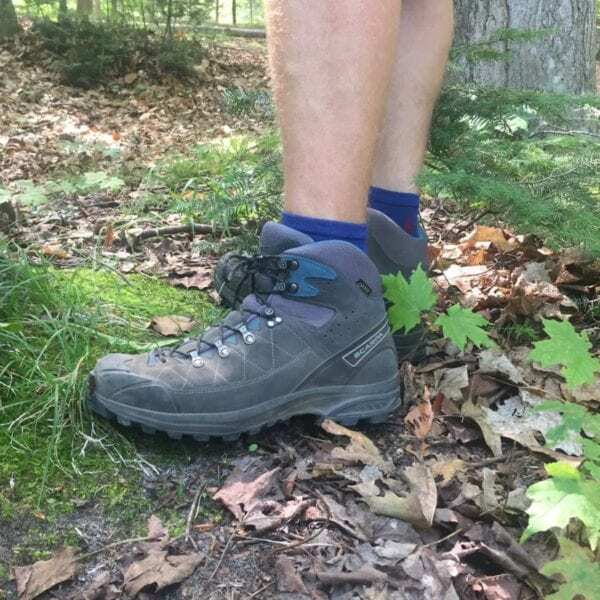 Right out of the box, the Scarpa Kailash Trek GTX Hiking Boot appear to be a solid, well constructed lightweight hiking boot with much promise. The exterior of the boot is made from brushed leather lower portion and synthetic mesh upper. 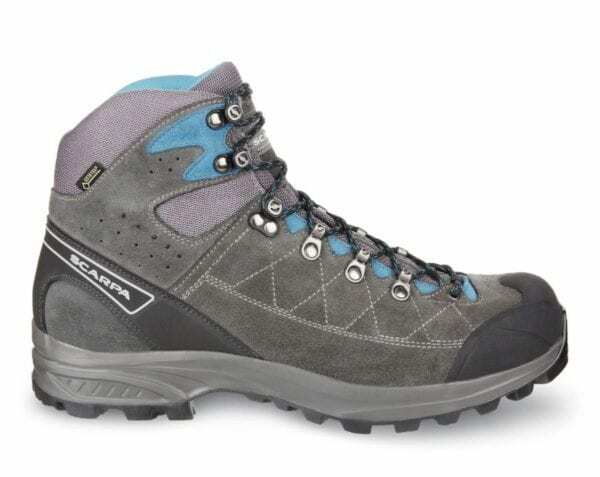 The Scarpa Kailash Trek GTX Hiking Boot comes in a single snazzy color of shark grey combined with lake blue. Both the toe and the heel of the boot are reinforced with hardened rubber. Tread on the Scarpa Kailash Trek GTX consists of deep grooves capable of ascending gnarly terrain. 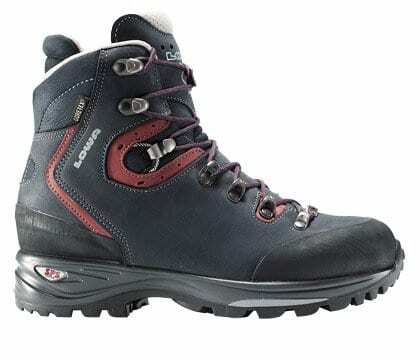 The lacing system of the of the Scarpa Kailash GTX Hiking Boot is a fairly traditional speed lacing system. All of the eyelets are made from metal and look to handle some hiking abuse. The inside of the boot is constructed with a GORE-TEX lining. The isole is a Comfort Flex Plus. 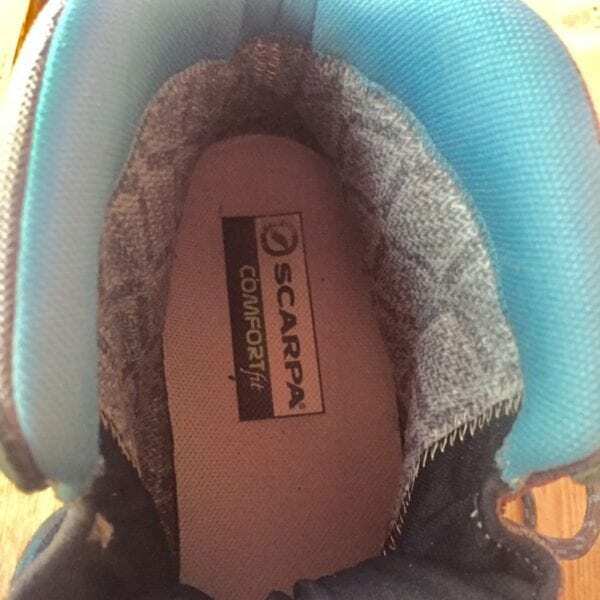 This insole is made from 5mm thick polypropylene and fiberglass support with a soft felt upper. 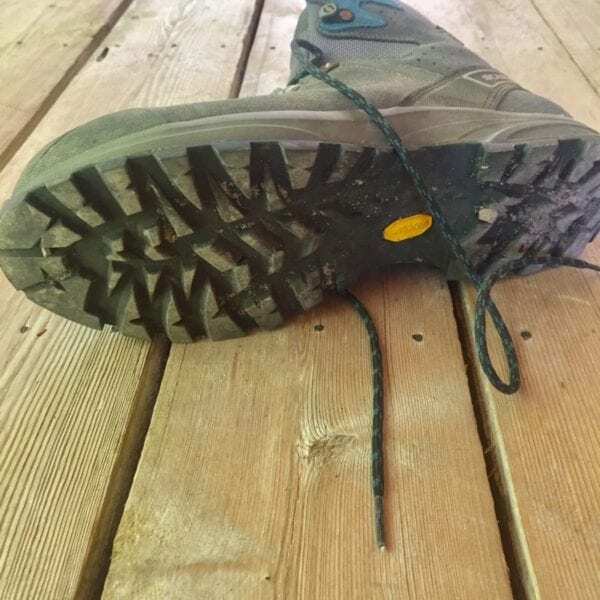 To date I have logged around 100 miles in the Scarpa Kailash Trek GTX Hiking Boot. My hikes have consisted of up to 10 miles and numerous hikes in the 4-8 mile mile range. 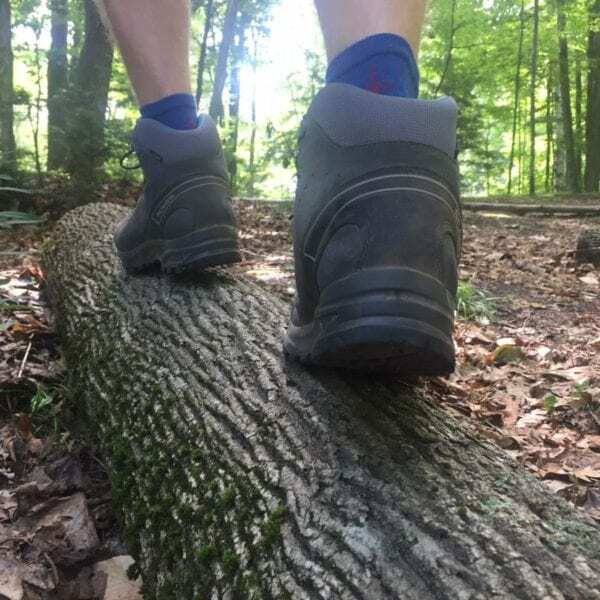 I have also tested the boots in hiking conditions such as underload, wet, dry, hot, cold, on trail as well as off trail. I was quite pleased at the comfort of the Scarpa Kailash Trek GTX Hiking Boot. As in all footwear, fit is they key component of comfort. I have fairly wide flat feet that take on serious abuse when the fit is not perfect. I wear shoe size 10.5 Men’s and the size 44 is a great fit. This boot is comfortably snug around my foot with ample space in the toe area. When I walk, including on steep inclines, I do not experience any slip in the boot. 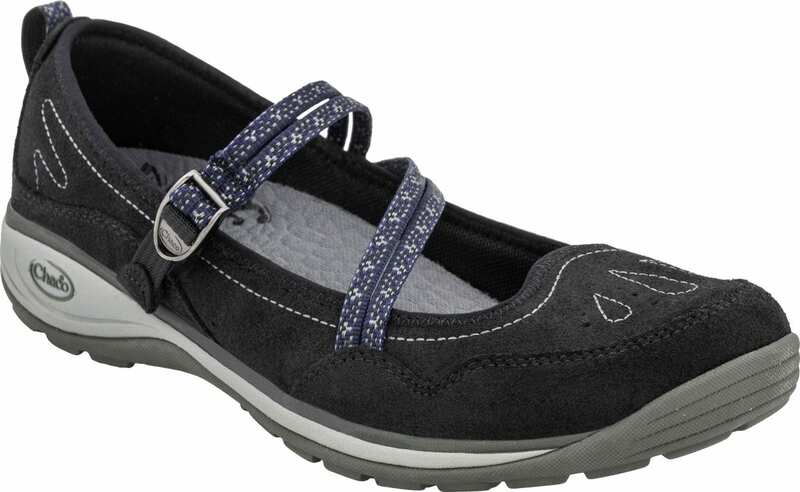 The Comfort Flex Plus footbed is very comfortable and very stable. 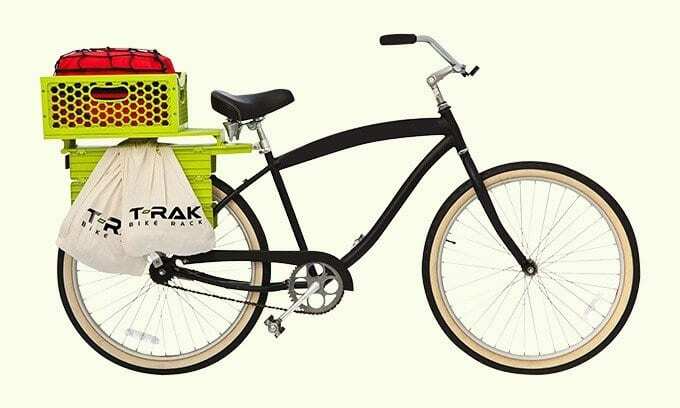 If my flat wide feet are experiencing comfort I am sure most anyone else would be having a smooth ride as well. This solid fit Scarpa Kailash Trek GTX Hiking Boot allows for all day comfort. These boots are perfect for the long hikes. My longest hike was on a hot day on a rocky trail. Along with an excellent fit was the breathability of the boot. Never did my feet get sweaty or uncomfortable on this hike or on any of the other hikes for that matter. Adding to the all day comfort is how lightweight these boots are. Weighing around 1.5 lbs per boot these boots are fairly light considering the amount of support they provide. Having a heavy pack on did not change the performance of the Scarpa Kailash Trek GTX Hiking Boot. These days, much of my hiking consists of strapping my two year old son to my back and exploring the backcountry. Fully loaded with toddler and the supplies that come with a small child my pack weighs around 40lbs. With the heavy and often times awkward pack the Scarpa Kailash Trek GTX Hiking Boot provided excellent performance as well as comfort. These mid height boots provided more than adequate ankle support, and I would feel comfortable carrying a much heavier load. I am a big fan of the deep lugs on the Vibram Soles of the Scarpa Kailash Trek GTX Hiking Boot. These have provided solid traction in rocky, slick, muddy, and snowy conditions. Recent scouting trips for the upcoming elk season have been some gnarly terrain and these boots have been awesome. Very few slips even on steep loose rocks. On hard-packed smooth trails these lugs may be bit of overkill but once off trail this feature is quite nice. GORE-TEX is awesome. Between the GORE-TEX lining and the leather outside the Scarpa Kailash Trek GTX Hiking Boot have been waterproof. Puddles and snowbanks have not soaked through. 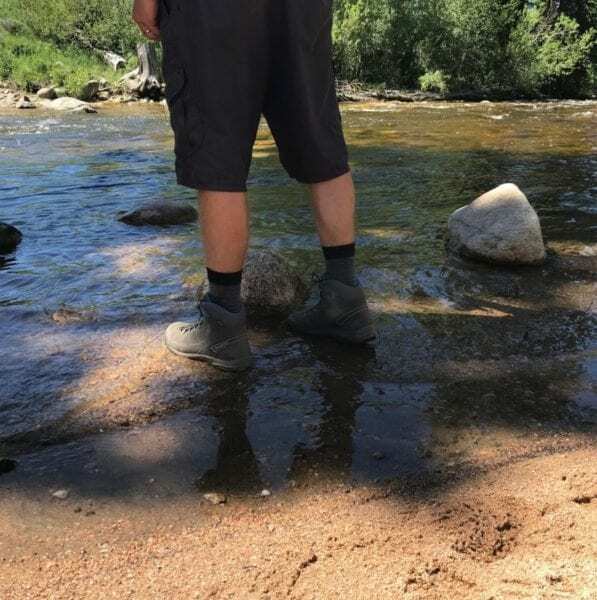 Additionally, I had these boots submerged half way up the boot when wading to a good area to cast my fly rod. 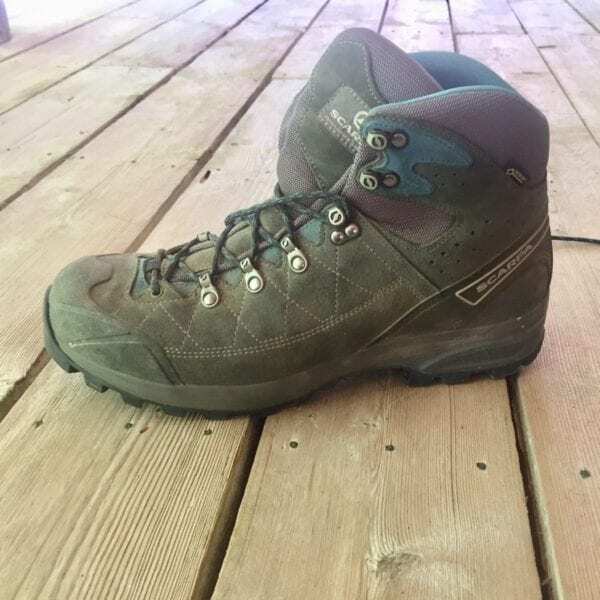 I am thoroughly impressed with the ability of the Scarpa Kailash Trek GTX Hiking Boot to keep water out and at the same time allow my foot to breathe. 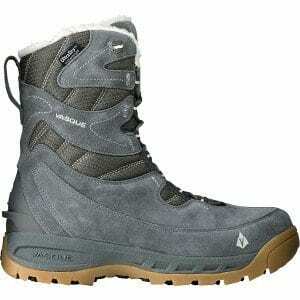 The Scarpa Kailash Trek GTX Hiking Boot is a great all purpose hiking boot. With outstanding comfort and solid stability this is a great do it all hiking boot. 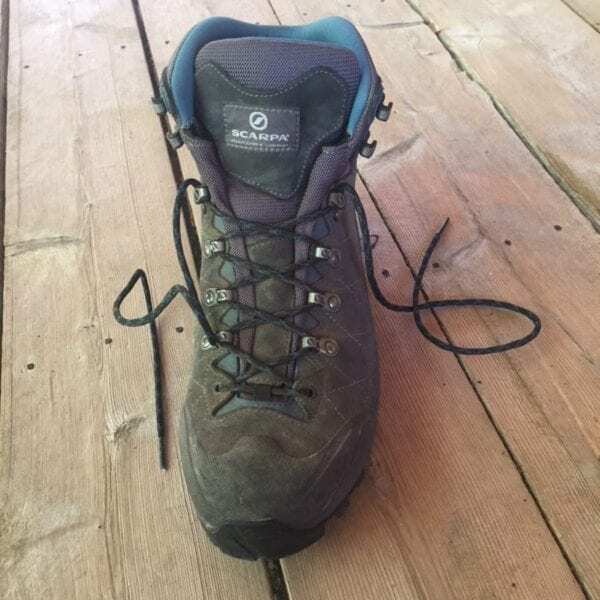 Additionally, features such as large tread, GORE-TEX lining, and the Comfort Flex Plus footbed make the Scarpa Kailash Trek GTX Hiking Boot a solid choice in hiking footwear.